Core 77 has a nice review of “Nomadic Furniture” by Victor Papanek and James Hennessey. It came out in 1974, well before laser cutters were commercially available, but the design ideas are perfect for our Glowforges! I had forgotten all about this book. My parents had a copy when I was a kid (kept alongside the Whole Earth Catalog), and I loved thinking about making a house full of things that I could fold up and take anywhere. Now I own way too much stuff, but it is still a nice fantasy. I think you might run into some issues with it rotating around the center axis, but that is what experiments are for! The 12X20 cut limit probably eliminates a lot of furniture but the same half lap /slot to slot concept will apply to all kinds of things that are size appropriate. This alien stool… $130 a piece, I wonder if they sold any. I built one in 1973, incredibly comfortable! Strong too! A 250 pound “friend” tried to destroy it by plopping down into it and jumping on it. It lasted three months of this abuse! GlowForge will help me make another one, but a lot faster! Would be cool to make this out of wood and use the living hinge for the bent parts. Those stools may be tricky on the size of the Glowforge, but I suppose anything is possible with some interesting joinery and lamination; the glue is stronger than wood! Mostly what I liked about the Alien was making use of the full sheet of wood/whatever loaded into the cutter. Sure… they could have achieved just as good of a stool and left material over, but likely that material would be scrap. Leaving it in the design lends a nice artistic element. 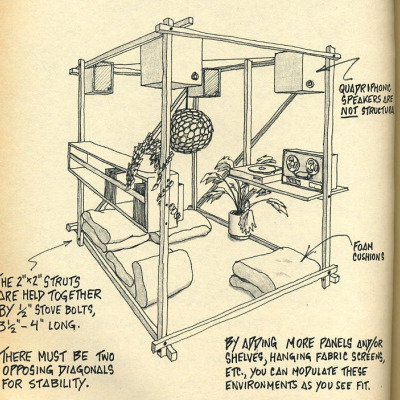 You all should check out the rest of the ideas in that book, and in the follow up (creatively titled Nomadic Furniture 2). The authors had ton of great ideas, many of which are not Glowforge compatible but will still get you thinking!